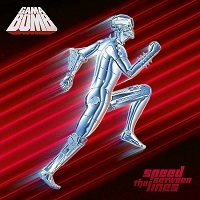 GAMA BOMB is one of the most successful Irish Thrash Metal bands of all time, and this year has seen the continual rise of the band and the release of their new album "Speed Between the Lines". It's a work of relentless force and outstanding prowess that reflects a hypothetical question about the bands origin. It makes one think that if this band had been at their peak in the middle of the eighties, and located in the bay area of California they would have been one of the best bands in the history of the genre. Quite the lively lads, one can't help but be infected by the mischievous, larger than life attitude of GAMA BOMB. Among other things, the band have been wise enough to keep two things that only legends can brag of having, humility and a sense of humor. They've developed themselves into well accomplished music professionals without losing their true essence on the way. With past albums that are fun, and feature movie poster style album covers, they maintain the ability to make fun of themselves, along with the rest of the world. This makes the band a breath of fresh air among a multiverse of ego driven, self centered and redundant bands that seem to plague the genre without any real purpose whatsoever. "Speed Between The Lines" is one of the most consistent Thrash Metal albums I have had the opportunity to discover in the last few years. With songs like "Bring out the Monster" which is without a doubt my favorite track of this album, GAMA BOMB have a sound that would appear to be a direct inheritance of JUDAS PRIEST. They manage to capture the spirit and energy around the song's creation. The song seems to emerge from one's pores to spread around your surroundings, both physical and sensory to become entwined somehow with the band's creativity. and specially as i appear toI feel the need to reiterate that their ability to incorporate humor into everything they do is key. Accompanied by a fairly accomplished production work not only in the musical aspect, but also on every different factor present makes all the difference here. It makes a record like "Speed Between the Lines" a complete communicative product from beginning to end.